With our Murphy Bed and Desk, you can customize the details to complete your decor. With the customizable options above, you'll have the ability to select whichever features you'd like for your new bed. Then, check out and get your order started with only 30% down, or add to your wishlist for later use. You can also e-mail or share this product on Facebook, Pinterest, or Twitter, and get feedback on your choices. With more than 10 years of experience in the Amish furniture market, we've come to understand that utility, style, and quality all play a role when it comes to designing the perfect space. Without missing any, our Murphy Wall Bed and Desk combine the timeless warmth and beauty of hardwood furniture, the quality of Amish craftsmanship, and a functional piece that will transform any room into a space conscious bedroom and office area with ease. Bench built from some of the finest North American hardwood harvested, our Hideaway Murphy Desk Bed is crafted with a charming, timeless style that offers space saving practicality and modern ingenuity - ensuring your piece is made to last a lifetime. Placed in a closed, upright position, your spacious workstation is available - offering plenty of space to get your work done. As the backdrop to your desk, the beautiful, raised panel design allows the natural grain pattern of the hardwood to make a statement for your decor. Dropping down in one fluid motion, the valuable contents of your desk are quietly tucked away - with no need to take anything down or move items before you head off to sleep. Once lowered, the comfy bed is available, in either Full or Queen sizes - ensuring you have a place to get some much needed rest for the a new day ahead. Raise it back up and continue where you left off with your work in an instant. Available in a variety of different hardwoods, you'll have the ability to complement your existing space or match other pieces of furniture that you plan to incorporate into the space. Shown in Brown Maple, you can also have this bed crafted in our most popular cherry wood, or opt for tiger maple or walnut for a unique look. Once you've selected your preferred wood, choose from a wide range of high-quality stains to add the right tones to your new murphy bed. Available in Full or Queen sizes, to suit your needs and also the available floor space in your room of choice. Finish it up with a matte or semi-gloss varnish for your preferred sheen and your new desk bed will be handcrafted per you order. We also have the ability to tailor this piece if there are some details that don't work for your decor. Call one of our experienced Furniture Specialist today to answer any questions, request a custom quote, stain samples, and to get your order started by phone. 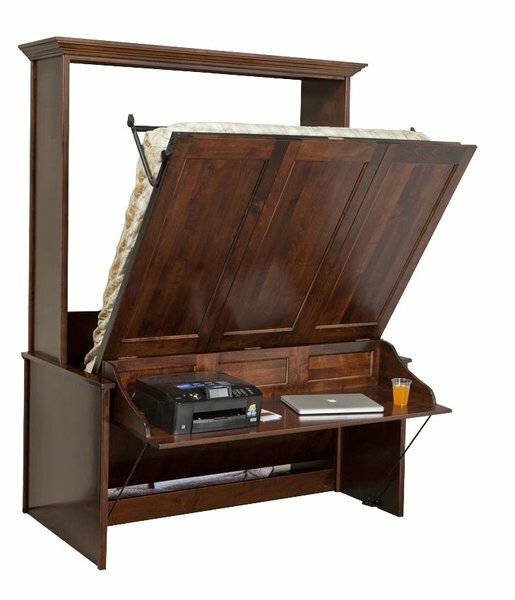 *The vertical end lift style is shown with the mattress facing up, with your head towards the wall, but you can also order this Murphy bed with the mattress horizontal, which expands the desk space and has the user sleeping with their side to the wall. A line drawing is available with the main photos to show you the difference of these two orientations. This Murphy bed is also perfect for furnishing a studio apartment, where space is at a minimum. This bed offers a unique combination of comfortable sleeping and spacious workstation that will open up your floor space without sacrificing quality. Learn more about furnishing smaller spaces! While we strive to make every piece as versatile as possible, we understand that your home is different and your requirements may be different. If there was something special you would like done with your new Murphy Wall Bed and Desk, or dimensions that are tailored specifically to fit your suite, please don't hesitate to call. Our furniture specialists are available to answer any questions, provide a free custom quote, stain samples, and help guide you through the order process. Toll-Free (866) 272-6773. Projection from Wall: 85 3/4"
*In-Stock Vertical Full Bed in Oak - Ready for Finishing. Projection from Wall: 62 1/4"
Projection from Wall: 68 1/4"
*8 1/2" of Vertical Space is Available on the Desk, Once the Bed is Opened. *Mattress is not included. A standard 10 - 12" mattress will work with this wall bed. *Grommet holes are also available by request. *Please note - bed sides and front come standard with same species wood veneer and a internal ply, which eliminates a possible splitting or warping that can occasionally occur in high stress situations with the wall bed mechanisms. Solid wood is available for these pieces at your request. Please call for a free custom quote. My guests love the new bed. I love the new desk. Amazing dual use room transition.